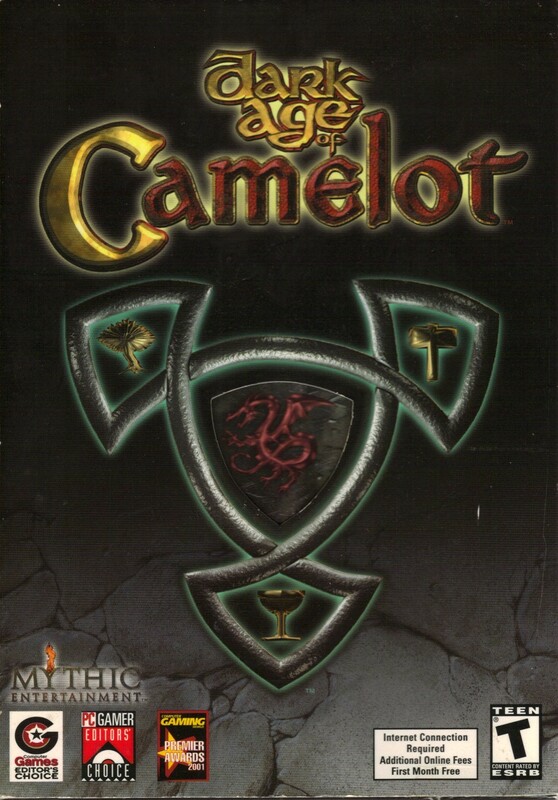 Launched in late 2001, Dark Age of Camelot is a long-running MMORPG from Mythic Entertainment. The game presents three realms: Albion, a typical The Dung Ages representation of medieval England which is heavily steeped in Arthurian myth; Midgard, a frosty, fjord-y representation of Norse mythology populated by Vikings and trolls; and Hibernia, built on Irish folklore and legend. The three realms war in Player Versus Player frontier areas, while each realm's home territory is dedicated to Player Versus Environment play. All Your Base Are Belong to Us: This trope tends to get invoked when one realm's keeps and towers are taken away by the enemy realms. Reclaiming them largely depends on the morale of the realm's population, and losing all of them can be detrimental to many players' willingness to go out there. Since this is a three-way war, whose keeps are taken changes repeatedly. Cast from Hit Points: The "Savage" class. Cluster F-Bomb: Particularly from one player (video NSFW) who felt he was wrongly deprived of his Cloudsong. Critical Encumbrance Failure: Subverted slightly. As you get closer to your encumbrance capacity, you begin to move slower. Once you go past it however, you're unable to move until you lighten your load a little. Critical Existence Failure: Played straight for the most part. As your health goes down, your character's movement slows down. Dynamic Difficulty: The instanced dungeon difficulty is largely based on how many players are in the group, and it scales up or down as players join or leave. Levelscaling: it's also based onte player's level to an extent. The Fair Folk: All over the place. There are tons of fairies and fairy-related creatures who are anything but benevolent. Forever War: Pretty much the entire point of PvP in this game. Genius Bonus: Naming England Albion after it's oldest known name is quite clever. Midgard was the name of Earth in Norse Mythology and considering Vikings originated in Scandinavia so it fits. However the game creators did commit Critical Research Failure by calling Ireland Hibernia and not Ériu or Éire. Götterdämmerung: Albion's time of strife after the death of Arthur. Grey and Gray Morality: The fight between the three realms, as none of them are specifically good or evil. Innocently Insensitive: A meta example: Earlier in the game there was a pooka (basically an evil black horse) named Spook. Presumably his name was meant to mean a ghost however someone pointed out that spook is also an obscure slur for a black person so the creature's name was changed. Inventory Management Puzzle: Good luck agonizing over which awesome loot to leave behind so you can stagger back to town! Istanbul (Not Constantinople): The Realms of Albion, Midgard, and Hibernia are Fantasy names of England, Scandinavia, and Ireland respectively . Last Stand: Players defending a keep lord as the room is being breached often experience this. Sometimes they hold off the attack, other times it doesn't go very well for them. Keystone Army: The Bonedancer class can summon up to 4 pets to aid them in combat...who all die instantly if the bonedancer dies. Averted by the Animist class in hibernia, whose turrets can stick around for a minute or two after the character's death. King Arthur: Albion's background mythology is the Arthurian cycle, and the titular "Dark Age" your character inhabits is the period after Arthur's death at Mordred's hands. Obvious Beta: The Hibernia realm was notoriously unfinished at the time of the game's release. Some of the dungeons weren't even open, most notably the Coruscating Mines. It took about a year and a half before all of the dungeons were opened and populated. Player Versus Player: Called Realm vs Realm in the context of DAoC, but very much the opposite of Player Versus Environment. Purple Is Powerful: The game uses a color system to indicate a monster's level relative to yours. The highest color is purple, which basically means the monster is way above your weight class and trying to kill it alone is likely suicide. Spiritual Successor: The developer went on to do Warhammer Online, and most DAoC veterans instantly felt right at home. There's also a reboot called Camelot Unchained currently in the works. Additionally, The Elder Scrolls Online has three-faction PvP that is easily comparable in general setup to the Realm vs Realm combat. This is especially the case since some of that game's talent developed this game. The PvE experience is different, with standards in questing inspired by World of Warcraft. Zerg Rush: The classic Albion attack, although the other two realms use this tactic regularly as well.